Meeting the Business Process Outsourcing needs of governmental and commercial organizations requires agile and highly scalable customer support technologies. In today’s data intensive world, speed, accuracy, and a passion for precise program management are critical. To deliver the highest quality BPO services Solix 360 employs next generation, cloud-based IT technologies. From telecommunications to healthcare and regional utilities, the Solix 360 platform is proven to support a wide range of detail intensive claims and eligibility processing, data recording, and customer care functions. Our advanced technology platform allows Solix to quickly bring workflow automation solutions for enrollment, eligibility determination, and case management to market across a wide range of industries. Our agile software development processes enable flexible solution design and faster time-to-market. We understand the needs of large-scale, consumer-focused programs. Our diligence and detail focus is why we are a leading provider of outsourced services to a broad range of organizations that require precise program execution and white glove customer care. Solix works hard to support the operational and business challenges of commercial and government operated programs targeting families across the nation. We understand the delicate balance that must be maintained between customer satisfaction and the need to manage costs and program efficiency. Our Solix 360 platform enables us to deliver the highest quality customer support while integrating critical consumer-specific data in a highly scalable, flexible and secure technological environment. We’ve invested significantly to make the Solix 360 technology platform highly adaptive to complex business processes. The platform enables rapid prototyping and implementation of client-specific business rules while reducing program time-to-market. We understand the importance of accurate eligibility determination, compliance management, and data security inherent in complex government and commercial based programs. 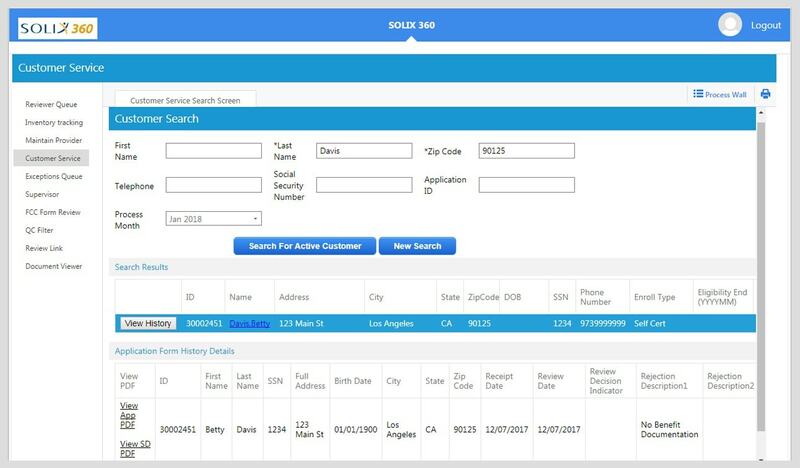 Solix 360 provides the system, templates and data integration to enable our Contact Center staff to process and case manage complex consumer programs. Our technology makes real time data capture and decisioning possible using customized application review templates. Solix 360 workflow, data, and critical program processes can be customized to client specific business needs and maintained according to client end user/customer requirements. Solix 360 technology supports client specific customer data intake and inbound customer support requirements. For 20 years Solix has supported some high profile, government and commercial programs. Let Solix show you how we can help you implement complex, large-scale support programs while delivering improved financial metrics for your organization. When efficiency, attention to detail, and customer satisfaction are key…count on Solix.